Celeriac & Leek Gratin – Dig Delve – An online magazine about gardens, landscape, growing & making. Although the excesses of Christmas and New Year may already seem far behind us, there are still a few culinary reminders lingering in the pantry. Now is the time to use up these last festive remnants, before they are consigned, with lashings of guilt, to the bin or the compost heap. A tin of macaroons will be crushed to make a crumble topping for damsons from the freezer, while the end of a jar of mincemeat mixed with some apple puree will make a filling for some quick turnovers. In the fridge are the last heels from the cheeseboard, including a fairly large piece of Stilton that defeated us, while in the fruit bowl, along with some wizened lemons and limes, are a few handfuls of shell on walnuts wondering what they did to deserve such ignominy. 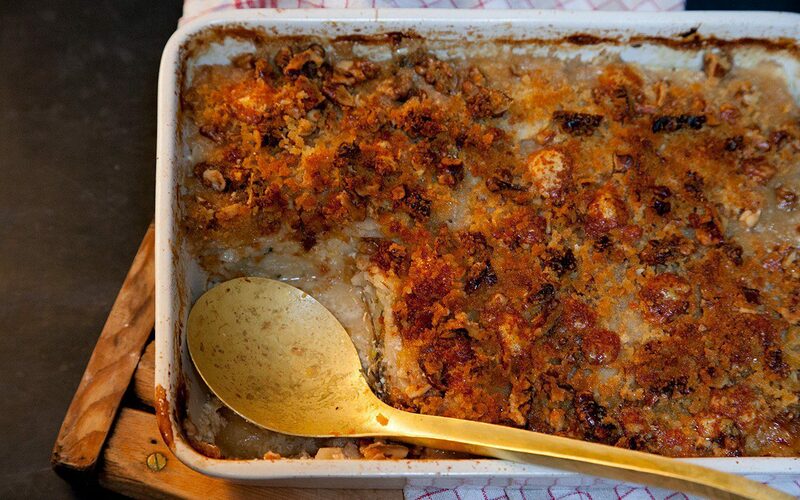 When the days are as cold as they have been recently, with the icy damp getting into your bones, a slow-cooked vegetable gratin holds the heat and is guaranteed to warm you from the inside out. This might be a simple potato boulangère, one made with spiced pumpkin and tomato, or something earthier made with roots. 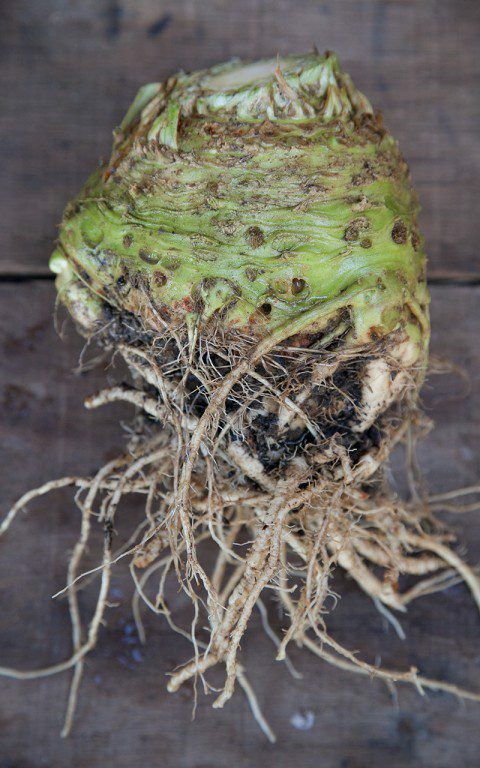 In the Kitchen Garden, alongside the cabbages and kales, we have a good stock of roots, but it is the celeriac to which we most often turn, preferring it to the sweetness of parsnips. 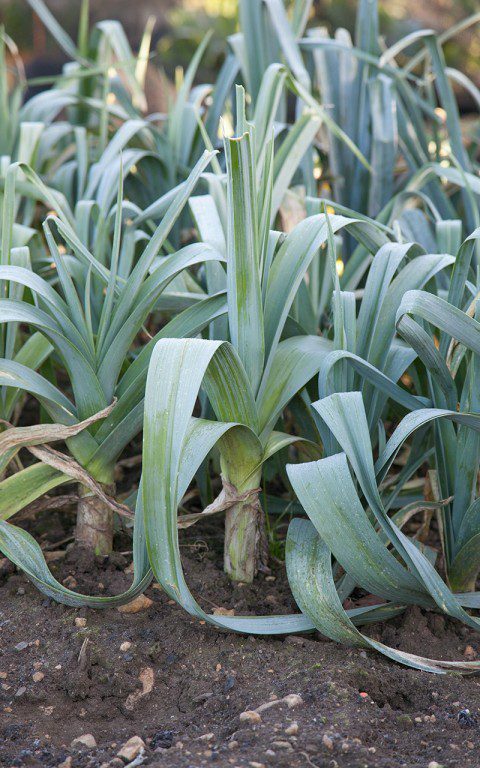 While it has a mineral, earthy flavour with natural umami that pairs well with nuts and sharp cheeses, the delicacy of leeks – growing in the neighbouring bed – are a less overpowering companion than onions. So much do we like celeriac that we give over half a bed to it. Twenty plants that see us through the winter from November to early March. Celeriac requires a long growing season, and it is only a few weeks until we sow the seeds of this coming winter’s crop, usually at the end of February. This we do under cover, as the seedlings are minuscule and prone to damping off. Germination can also be a bit erratic, so we always sow half as many again as we need to cover for losses and no-shows. Once germinated they take a couple of months to reach transplanting size. 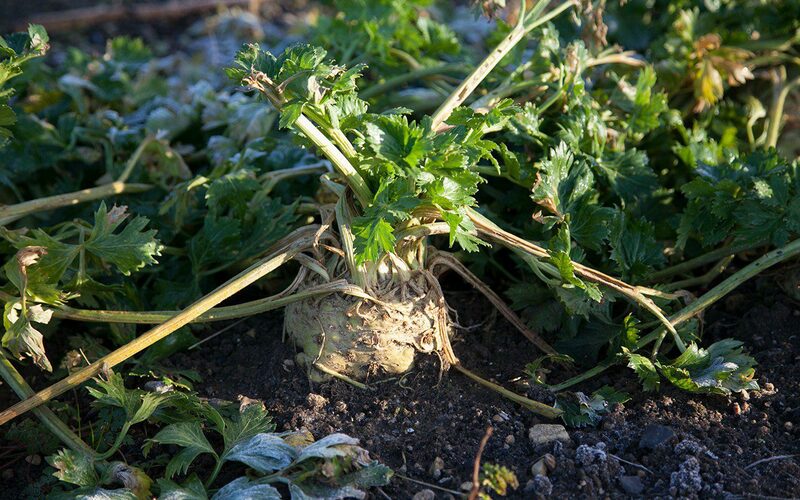 This happens in early summer, when they are planted out into soil that has been previously manured, as celeriac needs open, moisture-retentive ground with plenty of light to thrive. We have also found that the secret to good-sized roots is consistent watering throughout the summer, while a straw mulch also helps to retain moisture. This gratin is rich enough to serve as a main course, in which case a simple green salad or boiled, buttered cabbage are accompaniment enough. However, with its strong flavours, it makes a good side dish for roast chicken or beef. Melt 20g of butter in a saucepan over a low heat. Add the leeks and garlic and a good grating of nutmeg. Stir to coat the leeks with butter. Put the lid on the pan and sweat the leeks until soft and translucent, stirring from time to time. Do not allow them to colour. Remove from the heat and allow to cool. Quarter the celeriac roots and slice to the thickness of a pound coin using a sharp knife, mandolin or food processor. Put the celeriac slices into a bowl of water to prevent browning. Melt another 20g of butter in a small pan. Using a pastry brush use it to generously coat the base and sides of a ceramic gratin dish measuring around 22 x 30cm. Drain the celeriac, pat dry with a clean tea towel and cover the base of the gratin dish with one layer of slightly overlapping slices. Take 100g of the Stilton and scatter a quarter of this and a quarter of the leeks over the celeriac. Place one bay leaf and two sprigs of thyme on top. Season with a little salt and pepper. Arrange another layer of celeriac on top and press down with the palms of your hands to flatten. Repeat with the remaining ingredients, finishing with a fifth layer of celeriac. Pour the cream over the top and dot with some butter. 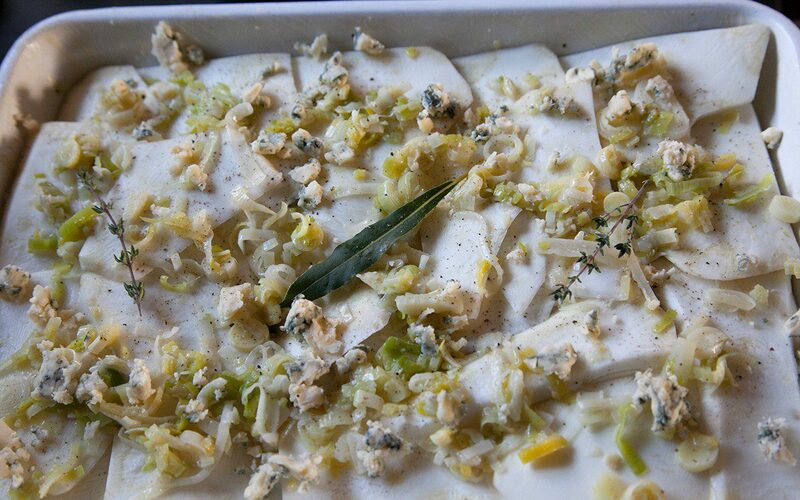 Cover the gratin dish with foil and bake in the oven for 45 minutes to an hour, until the celeriac yields to the point of a knife. Remove the foil. Press down on the top of the gratin with a fish slice to compress and flatten. Melt the remaining butter in a small pan. Put the breadcrumbs and walnuts in a mixing bowl and stir to combine. Pour over the melted butter and stir until the breadcrumbs are well coated. Crumble the remaining 75g of Stilton into the breadcrumbs and stir to combine. Spread the breadcrumb mixture over the top of the celeriac and return to the over for 30 minutes until well browned and bubbling. Take out of the oven and allow to stand for 10 minutes before serving.